The best move the SCDP can make RIGHT NOW. At least, until they can rebuild. Memphis, TN, September 22, 2015– The Shelby County Democratic Party wishes to reiterate that it has not and will not endorse candidates in the upcoming local elections. There are several groups and individuals that distribute ballots and or publish ballots in exchange for financial consideration by candidates. They imply endorsement by the Shelby County Democratic Party. 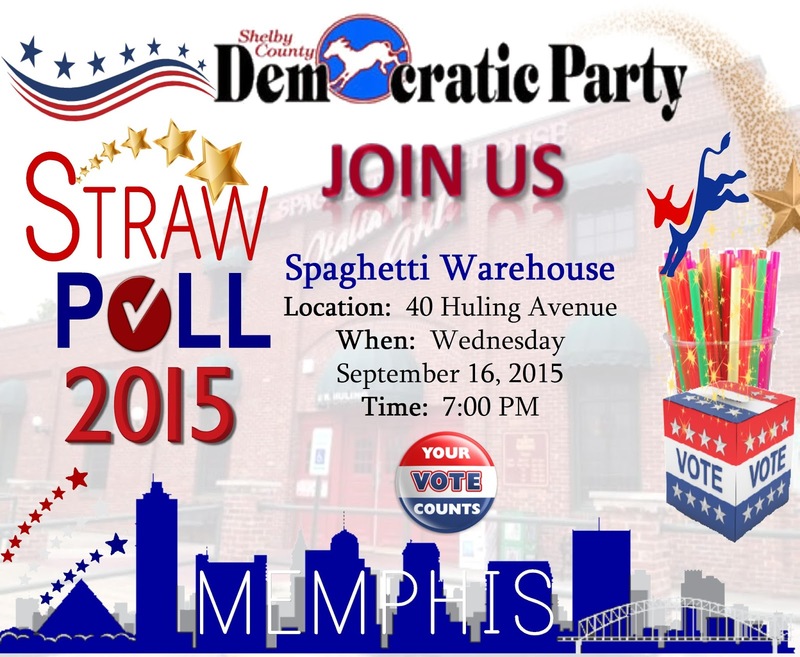 Absolutely none of these legitimately speak for the Shelby County Democratic Party. Note: Early Voting is going on now. · Early Voting ends October 3rd. · Election Day is October 8th. · If you cannot vote early, please visit ShelbyVote.com and use the Precinct Locator to make sure of your voting location for Election Day. Nashville, Tenn. (September 21, 2015) – The Tennessee Democratic Party is pleased to announce that Democratic National Committee Chair and Florida Congresswoman Rep. Debbie Wasserman Schultz will be the keynote speaker at this year’s Jackson Day Dinner. The Jackson Day Dinner, the TNDP’s largest fundraiser, will take place at 7:00 p.m., Friday, October 23, at OZ Arts Nashville, 6172 Cockrill Bend Circle, Nashville, TN 37209. Wasserman Schultz, who has been Chair of the Democratic Party since 2011, is a strong leader in the House and an effective chairwoman for the Democratic Party. She was elected to Congress in 2004 and represents Florida’s 23rd Congressional District. OZ Arts Nashville is the former CAO Cigars headquarters transformed by the Ozgener Family into a contemporary performance & installation space and event center. To purchase tickets to Jackson Day, visit www.tndp.org. I have serious and severe issues with the Jim Strickland 2015 campaign and his focus on youth crime. I think its reactionary. I think it plays to a group of voters who know nothing about youth outreach and how to improve the plight of back youth. I almost decided to vote for Mike Williams as a result. HOWEVER, Mayor A C Wharton has done little for the last 6 years he has held the Memphis Mayorship and little in the 7 years before that holding the Shelby County job to combat these either. He has continued the failing policies in all areas of Wharton. The same cronies are still there (Jack Sammons and the former CAO still being on the payroll). Jim at least would be open to changing his policies and his mind if and when they prove to not be working and would lead us in a new direction. Memphis deserves better than continuing the status quo. That is why I am not voting for Jim Strickland, that is why I VOTED for Jim Strickland. I am in the Flyer this week! I tweaked this post about the refusal of Memphians and Shelby Countians to elect women to executive positions, and with some excellent editing from my mentor, Jackson Baker, this is the result. Also, if you see a copy of Lexie Carter's SHELBY DEMOCRAT on your newsstand, pick it up as well, as it has a copy of the original post, thanks to Lexie for that! Commissioner Jones, we are watching. There will be two Republicans seeking the office of Chair of the Shelby County Commission this afternoon, when it should already have been settled weeks ago. It was supposed to have been Steve Basar, a moderate Republican (a rarety these days) who has aligned more with the Democrats since Justin Ford became Chair last year, versus Terry Roland of Millington, who isn't moderate about ANYTHING. The initial vote went to Basar, and things appeared to be settled. However, later that day, after Roland had taken Commissioner Eddie Jones into another room for "discussion", then Jones, who had voted on the prevailing side, used that parliamentary position to move for reconsideration of that vote, which than passed, reversing the Chair vote. Terry Roland may well represent the views of his Commission District (which doesn't speak well of it, frankly) but he sure as hell doesn't represent the views of the majority of this County. In short, Commissioner Jones, WHAT THE HELL WERE YOU THINKING? Today, while newly elected Vice Chair Van Turner presides, the vote will be held again. Commissioner Jones, we will be watching you to see if you vote for your district by supporting Steve Basar, or for personal reason and Terry Roland. You will notice, Commissioner Jones, that there will be a crowd full of people wearing blue shirts to remind you how you should vote in the interests of your district and the Party under whose banner you were elected. We will all be paying attention to you and your decision. And we will remember it. UPDATE 3:28 PM: Commissioner Jones nominated Roland, who won on the second ballot, 7 votes to 6 and was joined by that other "Democrat", Justin Ford. Do we have recall for County Commissioners? Nashville took my advice and voted heavily yesterday, doing what Knoxville did four years ago and Memphis and Shelby County have so far refused to do and elected a female Mayor for the first time. And, no, I don't see this as leading to a groundswell for Sharon Webb, either. Congratulations to Mayor-Elect Barry, who was also the first sitting Metro Councilor to be elected Mayor. She beat David Fox, who seemed to be doing well until he started campaigning like a Tea Partier, which turned off the city in short order. Congrats as well to Colby Sledge, who won his runoff in District 17. So then, why hasn't this happened here? The largest voting bloc in the City of Memphis, and Shelby County for that matter, is African-American women. These women have gladly supported their sisters of ALL colors for legislative position, giving us great fighters like the late Lois DeBerry and Kathryn Bowers, as well as current leaders like Karen Camper, Raumesh Akbari, Barbara Cooper, and Senator Sara Kyle. However, when it comes to electing women to Executive positions such as Mayor or County Mayor, not so much. While it is easy to see how Carol Chumney's 2002 loss to AC Wharton in the Democratic County Mayor primary can be attributed to the excitement that Wharton would be the first African-American elected to that office, she didn't get much help from African-American women when she challenged W.W. Herenton in his final run for City Mayor in 2007. And if you wish to suggest that race was a factor in those elections, then what of Deidre Malone, who lost a Democratic primary to Joe Ford for County Mayor in 2010, and who lost the general election for that office to Republican incumbent Mark Luttrell in 2014? Why can't a woman be elected Mayor in this town or county? I am going to suggest that our African-American sisters, who vote in larger numbers, refuse to vote for women for executive positions for religious reasons. There are black churches in this town, LOTS of them, that are to the right of Bellevue Baptist on social issues, and these godly women are simply unwilling to elect a woman to an office that they believe should remain only in the hands of a man. Yes, I know it's 2015, and I can't go with that, but I'm not a member of those faiths. It does suggest to me, however, why it is so difficult for a woman to achieve that office in this city or county. Our suburban neighbors, Germantown (Sharon Goldsworthy) and Collierville (Linda Kerley) have done so, but those are mostly white, affluent cities with more liberal churches. No, because I am NOT a major media outlet with the resources to run a poll and use that as a question (coughCAcough), I have no data to substantiate or disprove my theory, but it's the best one I have at the moment. If you think I am full of crap, tell me so in the comments, but you have to tell me WHY. Today is the runoff in Nashville/Davidson County. No, I don't live there but I have lots of friends who do. I ask that if you are there and have not yet done so, please vote for Megan Barry for Mayor, she will do a great job and won't turn the city over to hedge-funders like George Fox, brother of her opponent David Fox. Also, if you live in Metro Council District 17, you should vote for Colby Sledge, a good guy who will represent you well on the Council. SCDP Straw Poll Next Wednesday Night! I have NO VOTE in any of these races, and your mileage may vary, but I want you to know whom I would vote for in these districts. Remember, chances are I would NOT vote for someone supported by the Chamber of Commerce,except in one interesting and delightful situation that we will address later. DISTRICT 1 - Bill Morrison has been very disappointing to all who supported him initially,but I know little or nothing about Wayne Roberts. I got nothin' here, your call. DISTRICT 2 - This s the seat being vacated by longtimer Bill Boyd, and the one that they tried to screw Rachel Knox out of by redistricting at the last minute until enough hell was raised to stop it. The gentleman for whom Boyd tried to gift-wrap the District 2 seat is Frank Colvett, Jr., the owner of GreenScape Inc., who has also served as Chair of the Shelby County Board of Adjustment. A look at his website on the issues indicates the standard boilerplate conservative WE HAVE TO CUT EVERYWHERE mantra, except that, as one could expect given his line of work, he does want to offer green solutions regarding development. Pension-The city has a debt problem, not a pension problem. However, it is important to note that the current plan treats all divisions of its city employees as one unit without regard to those employees that work in self-funded sectors of the city. I propose that we evaluate each division of the city’s budget. By doing so, we will adequately assess and implement plans that best fit employees as separate groups. In this way, both the city and its employees can benefit and Memphis would once again become an attractive location to recruit and retain new city employees. Go look at the rest of her issues and believe you will agree she is the best choice for Cordova and the city in general. DISTRICT 3 - There are several well-known names here, like Tanya Cooper, Sherman Perkins Kilimanjaro and Rhonda Banks, but the three candidates fighting it out and most likely to make a runoff are former candidate for Register Coleman Thompson (Full disclosure: we served as Co-managers for Carol Chumney's 2002 County Mayor campaign), and the two people who split the anti-Justin Ford votes in last summer;s Commission race in Whitehaven, former MCS Board member Patrice Robinson and former President (and now Executive Director) of the Memphis Education Association, Keith O. Williams. My heart is with my friend Coleman Thompson, but my head says we need another voice for Labor at the table, so either Thompson or Williams would be good for the city. DISTRICT 4 - The most surprising thing about this race is that former Steve Cohen congressional staffer Randy Wade pulled a petition for District 4 but did NOT file. Had he done so, his name recognition would have put him firmly in position to win. However, he never filed, which opened the field dramatically. Among the well-known names in this race are Donnell Cobbins, John Cornes (who has a lot of signs up), Doris Deberry-Bradshaw and Jamita Swearengen. However, my choice is the up-and-coming creator of the Humans of Memphis site, Kirstin Cheers. At 24, she is young, but if you have been paying attention to this blog this year, you will not be surprised that we support younger candidates here. A lifelong resident of the Glenview community, she has the spark and the vision and the energy to represent this district. We have an opportunity for change here; just as we have in our support for John Marek, Rachel Knox, Zachary Ferguson and Robin Spielberger, we believe it's time to toss out the old guard and move the city FORWARD and Kirstin Cheers will be a big part of that movement. DISTRICT 6 - Edmond Ford, Jr. is someone that I believe should be Mayor of Memphis someday, so it should not be surprising that I support his re-election, the ONLY District Councilor whose re-election I support,. Quiet, studied, never abrasive but always thoughtful, he is a rock on the Council and deserves our support, now and in the future. DISTRICT 7 - Interim (for the 2nd time) District 7 Councilor Berlin Boyd lost any chance of support from me when he refused to name the party who requested the moratorium on development for the Pinch District, which is part of 7. I do not believe he has the vision for the city and the District that it needs. Though Thurston Smith is not the youngest candidate in the race, I do believe that his governmental experience and his determination to make the district a better place to live make him the best choice in District 7. He was the SCDP's Parliamentarian and he was always impeccable and impressive with his knowledge of the position. Eric Dunn is an up and comer, but I would vote for Thurston Smith if I lived in that District. SUPERDISTRICT 8, POSITION 1 - I have to admit that Joe Brown (not to be confused with the former judge) is not my favorite person, but he is beloved by the voters in the SuperDistrict, he is opposed by George Thompson and Victoria Young. I expect Councilor Brown to win handily, I have no recommendation here. SUPERDISTRICT 8, POSITION 2 - Janis Fullilove may be misunderstood by those who do not live in SD 8, people may think whatever they want, but Janis Fullilove is absolutely in touch with her voters and will not be defeated. Though she is one of the most pro-labor votes on the Council, the Chamber of Commerce realized the futility of supporting one of her opponents, and endorsed her re-election, and I do as well. Her heart is always in the right place, which any of her radio listeners could have told you for the last 40 years. She took a risk in the African-American community by not only supporting the Non-Discrimination Ordinance, but SPONSORING IT as well. Janis is opposed by J.Eason and Isaac Wright, but they have no chance. SUPERDISTRICT 8, POSITION 3 - The epic SD 8 battle is here, with Mickell Lowery, son of Myron, battling former MCS Board Member Martavius Jones. I like them BOTH. Mickell meets every criteria we have here at LWC regarding youth and fire and desire, and would be a perfect fit. However, even though he ran against FRIEND OF THE BLOG Reginald Milton last year and I had to work against him, I admire Jones for having the guts to do what had to be done in surrendering the MCS Charter, which saved our funding sources. They are both excellent choices and I do not know what I would do if I had to push a button. This is one race where, whomever wins, the SuperDistrict does as well. I have heard that my friend and Congressman, Steve Cohen, has chosen to endorse AC Wharton for re-election. He has endorsed Mayor Wharton each time he has run for County or City Mayor, which is his right to do so. Funny thing, though. I can't EVER remember Mayor Wharton returning the favor when the Congressman has sought re-nomination and re-election. Mayor Wharton seems to be afraid of offending people, people who have never done as much for the Mayor as the Congressman has done for him. I don't understand it, I am not joining him in that effort, but I respect his right to do so and will continue to support my friend and Congressman. It would just be nice, next year, if the Mayor does manage to win re-election, if he would remember the man that helped put him there.